A2 Platinum Premium Toddler Milk Drink is based on a unique whey and casein protein blend from cows' milk where the Beta-casein protein is guaranteed to be only the naturally occurring A2 type, and not A1. It has been formulated to used as part of a toddler's healthy diet which includes a variety of foods. 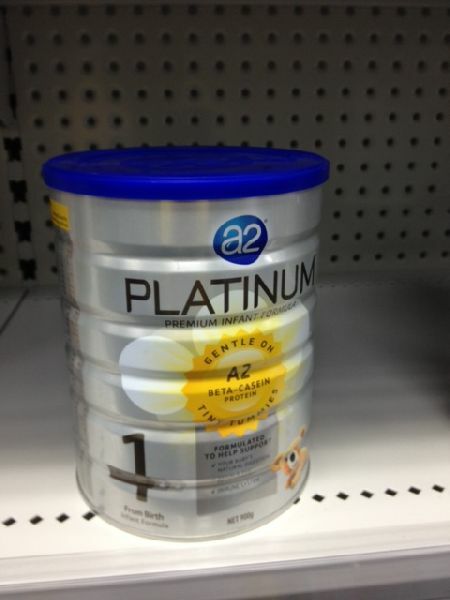 3 A2 Platinum Premium Toddler Milk Drink. Specially formulated to supplement the normal diet of an active toddler from 1 year, when their dietary intake may be inadequate. This nutritionally advanced milk drink, tailored specifically for toddlers, is more than a standard cows' milk. It provides the natural benefits of the naturally occurring A2 Milk, to help ensure toddlers gain full nourishment from their diet. Plus, additional nutrients needed at this time of intense and rapid growth and development. Iron, Vitamin B12, Vitamin C to help support healthy immune system. Vitamin A, Vitamin B6, Thiamin, Zinc & Iodine to support healthy growth and development in children. Calcium & Vitamin D to help support healthy bones and teeth. A2 Platinum Toddler Milk Drink can be used on its own or mixed with other foods suitable for a toddler. A 114mL serve provides from 15-47% of the recommended daily intake (RDI) of 16 essential vitamins and minerals for normal growth and development in toddlers. Healthy growth & development in children. Milk Solids [Skim Milk, Lactose, Whey Powder Concentrate, Whole Milk, Demineralised Whey Powder], Vegetable Oils [Soy, High Oleic Sunflower, Coconut, Canola, Emulsifier (Soy Lecithin), Antioxidant (Mixed Tocopherols)], Galacto-Oligosaccharide [GOS], Dried Fish Oil [Sodium Caseinate, Emulsifier (Soy Lecithin)], Minerals [Magnesium, Calcium, Iron, Zinc, Iodine], Acidity Regulator [Calcium Hydroxide, Citric Acid], Vitamins [Vitamins (A, B6, C, D, E), Thiamin, Riboflavin, Niacin, Folic Acid]. Further Nutritional Information may be display on back of pack.